You are here: Home / Featured / PREVIOUSLY ON… #40: Heroes in Crisis #1 vs. Identity Crisis backlash, and Chelsea Cain vs. the World! This week I take a look at the first issue of DC’s Heroes in Crisis and what should be made of comparisons to DC’s 2004 event, Identity Crisis. Then it’s on to updates on the DC Walmart Giants and my pick for comic book thing I love this week! I’ve been both eagerly and anxiously awaiting the release of Heroes in Crisis the (now) nine part event series from DC Comics. On one hand, the creative team of Tom King and Clay Mann is one of my favorite in comics, and King’s writing (Vision, Sheriff of Babylon, Grayson, Omega Men…) has been some of my favorite in the industry since 2016. On the other hand, the heady premise of Heroes in Crisis is a dark, troublesome sell. At various times in the PR cycle, DC has marketed the event as a murder mystery (ok), a mass shooting (… no? ), and the spiritual follow-up to 2004’s Identity Crisis. It’s this last piece that has particularly riled up a market share’s worth of fans who have been a part of Identity Crisis’ substantial critical reexamination over the course of the 2000’s. While the mainstream perception of Brad Meltzer and Rags Morales’ Identity Crisis maintains one of DC’s most popular event series in the publisher’s history, the book’s cavalier application of “adult themes” has left many deeply critical of the comic. Comics Alliance famously ranked Identity Crisis one of the worst comics of the 2000’s (right up there with Marvel’s Ultimatum), and the podcast War Rocket Ajax has locked in Identity Crisis as its worst comic book story ever as long as I’ve been listening to their (highly recommended) “Every Story Ever” lists. I won’t spoil what happens in Identity Crisis, and fans new to DC Comics (or long time fans who simply haven’t read that period of the publisher’s history) should absolutely read the story themselves to determine how they feel. 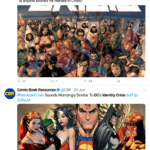 I raise this comparison simply because it’s become unavoidable, and the rampant assumptions that Heroes in Crisis will make all the same mistakes as a 14 year old comic from completely different creators drives me up a wall! I discuss as much in detail on the “Road to Heroes in Crisis” podcast, but Heroes in Crisis faces the odd challenge of fan’s desire to proclaim a refusal to read a new story based on the perception that it will be similar to an older, unrelated story. 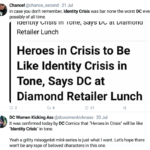 DC is absolutely to blame in creating this perception – they literally made the Identity Crisis comp themselves – but it’s beyond short-sighted to not let Tom King and Clay Mann’s work to this point indicate a different approach. Having read Heroes in Crisis #1, I can pretty confidently proclaim this series is going to play out quite differently in tone, execution, and theme than Identity Crisis. It’s a somber first issue, with genuine tragedy at its heart, but it also feels – so far – like more of a good faith effort to address what that destruction of hope represents. 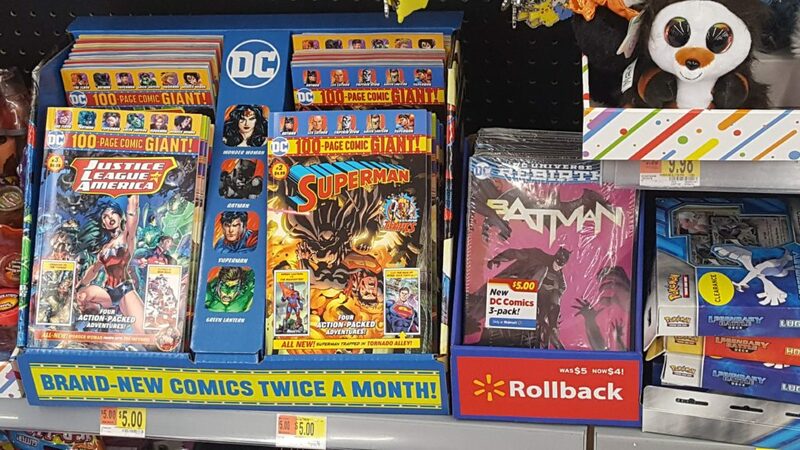 A few weeks back I discussed the rise of DC’s Walmart giants, and my own challenges in actually locating the comics within the superstore. Well a mere week later – surely, as a result of my own scathing journalism – my local Walmart has relocated their comics within the “cards & toys” checkout section, and added a selection of actual honest to goodness comics bundles for $5. This is clearly an improvement, and as I noted when I shared the photo, five bucks for a copy of Batman #1 (plus two other DC Rebirth era Bat-starting places) is actually a fantastic deal. 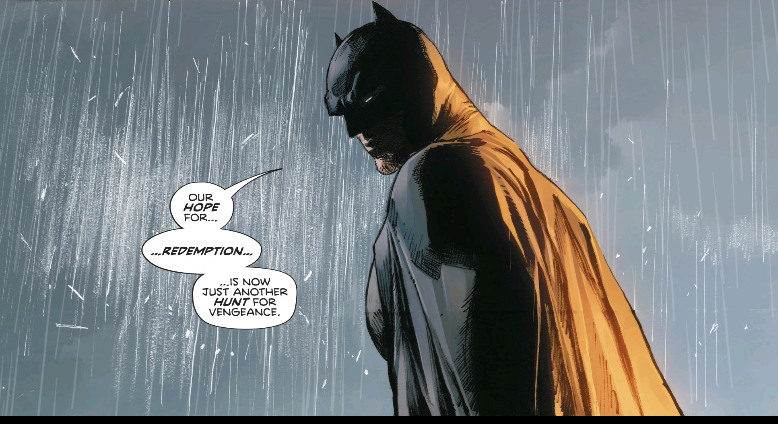 I can say from experience that most local comic shops are selling Rebirth Batman #1 for well over $5. During this visit I also found a copy of Superman Giant #3 which contains the fist part of Tom King and Andy Kubert’s 12 part original Superman story. As all the Heroes in Crisis chatter above should make clear, I’m a big fan of King’s DC Comics work, and “Up in the Sky” is no exception. Essentially, Superman is put onto a kidnapping case by Batman, and despite his many responsibilities to save as many people as he can, Kal-El just can’t shake the feeling that he needs to save this one girl. I wasn’t necessarily planning on collecting all the Walmart Giants just for a 12 page original story every month, but “Up in the Sky” is good enough that I’ll probably forgo all fiscal responsibility and collect as many issues as I can. My love is writer Chelsea Cain’s openness discussing Marvel’s inexplicable cancellation of her 6 issue Vision miniseries with artist Aud Koch, as well as her willingness to talk about the toxic harassment that she received over her eight issue run on Mockingbird in 2016. 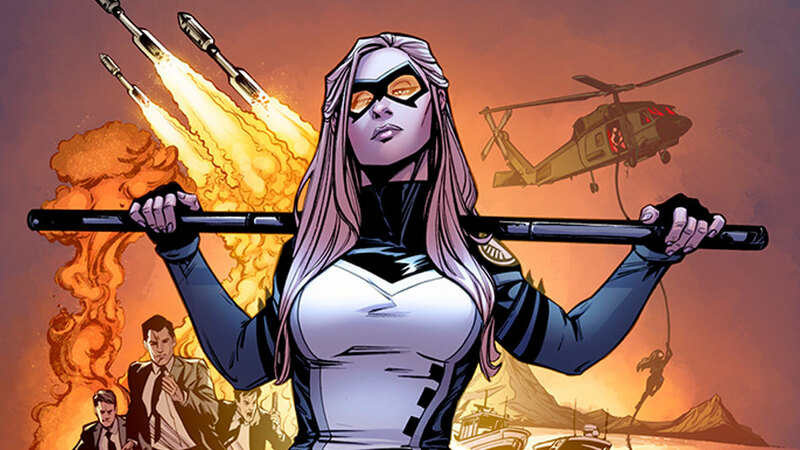 Cain surprised me with a wonderfully inventive and engaging Mockingbird series. With the creative partnership of artist Kate Niemczyk Mockingbird became one of my absolute favorite Marvel books of 2016. Naturally, I was fully on board for Vision, the long-awaited proper follow-up to Tom King (there he is again) and Gabriel Hernandez-Walta’s 12 issue run on the character. Instead the book was cancelled by Marvel the day I asked my local comic shop to pre-order for me (absurd!). I certainly don’t love that factoid, but I do love that Cain has been refusing to comply with Marvel’s apparent requested gag order, and has a stellar Image Comics first issue of Man-Eaters #1 (back together with artist Kate Niemczyk) available. While the two elements may not go exactly hand in hand (I hope the toxicity that has followed Cain played no part in their cancellation of Vision but it’s hard to be sure), the episode is well worth an occasionally hard listen. Excellent reporting all around that reveals layers to the worst aspects of comics culture that weren’t even on my radar. So I just read the last two Previously columns (well, four, but I’d read #37 & 38… well, previously). And I’ve gotta say I really miss this column since it left Patreon. Glad to have seen it again. So Dave, I have to ask. What are your feelings on Tom King?